That’s the new message from Transport for London. Their freshly launched poster campaign aims to increase passenger vigilance, which has noticeably tailed off in the months since July. This campaign emphasises the fact that the public have a part to play by being vigilant, looking after their property and reporting anything suspicious they see or hear to staff or police. Says Chief Superintendent Mike Humphrey from the Met. 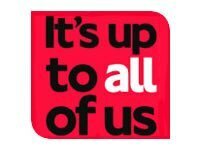 So, it’s up to all of us, but are all of us up to it? How often do you see a naïve tourist haul their suitcase onto the tube, plonk it down by the doors and then take a seat halfway down the carriage? And how many people actually ask who that case belongs to when they board the train and see it lying unattended? This very British reservedness needs a good prodding once in a while. TfL’s campaign will help to remind us to look at things on the transport network, instead of keeping our heads bowed in Sodoku sanctuary. Given the impracticalities of using scanners and bag searches on the Tubes and buses, ‘all of us’ are indeed the biggest security asset available. Our solution: fit all iPods with explosives detectors.